Almost $500 million in real estate development is quietly arriving in Emery Village in two big developments that will have a big impact, and increase business activity, density, and property values, observers say. 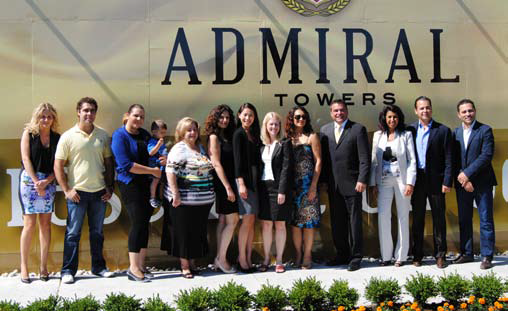 Located at Weston Road and Toryork Drive is the recently announced condo project “Admiral Towers” by Solmar Development Corp. which has just launched. Construction will begin at the end of the year with occupancy slated for September 2015. Solmar President Benny Marotta, who spoke during the unveiling this summer at the presentation centre said, “What makes this a news story is the fact that it’s a big condo project happening in an essentially unexplored neighbourhood of untapped potential. We really believe in this area (Emery Village) and that’s why we are committed to building four luxury condos here,” he says. The Admiral Towers project will be unique to the area, featuring condos with European styling and finishes, stateof- the-art amenities, nine-foot ceilings, 24-hour concierge, and separate alarm systems for each unit. Encouraging for neighbourhood residents and businesses is that these developments come as a result of recognition of a three key Emery Village characteristics: a low crime rate, attractive property values, and excellent arterial road access. Some developers compare Emery Village — bounded by the 400 highway in the East, Islington in the West and the 401 in the South with Steeles Avenue to the North — to a suburban version of downtown Cabbagetown in the 1970s: opportunity rich. According to business owner Gail: “It’s great news. We need more people out there spending money, and more residents here, period,” she said. Creating the conditions for Emery Village’s success is not lost upon Ward 7 Councillor Giorgio Mammoliti. “Families need to know we are here for them with policies that keep the crime rate low. With me insisting to this developer that he creates dwellings with three bedrooms, it means that the Admiral Towers development is also an active family experience.” Make no mistake, Mammoliti continues: “Investments like we are seeing here are transformative for the community,” he says. In recent years, Emery Village had not seen significant investment. However, strong partnerships between the BIA, residents, developers, and Toronto’s Economic Development Agency have combined to retain long-term locals and attract newcomers. Meanwhile, another development property, on the south east corner of Finch Avenue and Weston Road has already begun the initial phase of construction of what will become 1,400 residential units and 48,000 square feet of retail with the first 19- unit building also set to be completed in 2015. When it comes to the Admiral Towers project on Toryork Drive, Marotta says, “Emery Village has that unique position of being a hidden gem in plain sight. Sometimes in life you just have to recognize what’s right in front of you,” he says.